Our findings here echo those discussed in a prior post that Republicans have moved further to the right than Democrats to the left in the contemporary period. 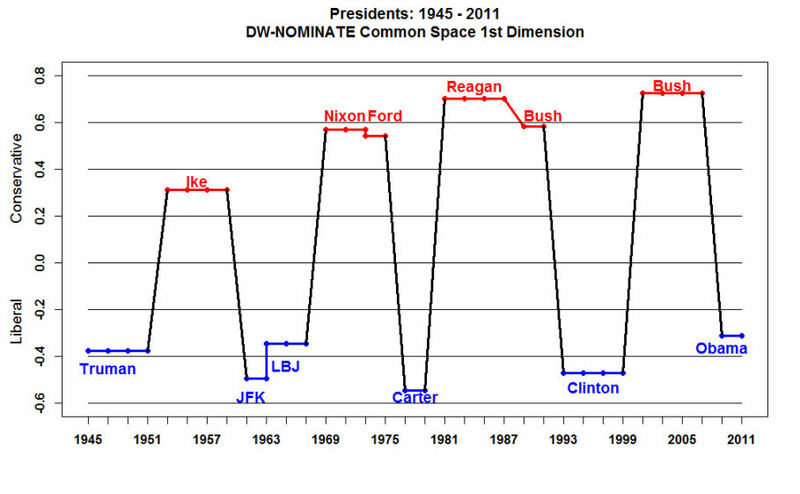 Indeed, as seen below, President Obama is the most moderate Democratic president since the end of World War II, while President George W. Bush was the most conservative president in the post-war era. On the other hand, in many ways Obama has had success at passing liberal polices in some areas where other Democratic presidents have failed. This success might be partially because of his moderation, and that a more liberal Democrat might have had fewer successes. Newt Gingrich talks of being a historian, but like most conservative “thought leaders,” he tends to get most of his facts wrong. Responding to Gingrich’s statements often seems a waste of time because, beside the repulsive moral code he promotes, he bases his arguments on premises which are out of touch with reality. Besides, it is questionable as to how long he will remain a meaningful candidate. Ben Adler has a theory that Gingrich gets his facts wrong because, “Gingrich still seems to live in the last decade that he was relevant: the 1990s.” This theory works for Ben’s current post. I bet that he wouldn’t argue with my belief that, while this might be somewhat accurate in the example Ben discussed, there are also many other statements from Gingrich which have never been true, at least in our reality. Maybe there is some alternative universe out there in which Gingrich sometimes gets history right. Check out the full post for Adler’s suggestions as to future elites which Gingrich might attack. How about elite disgraced former members of Congress who are backed by wealthy benefactors enabling them to run for president? With all his attacks on elites, Gingrich is an elite even if not elite (or sane) enough to ever get elected president. Gingrich has scheduled a press conference for tonight, after the Nevada caucus which he is expected to lose. This has led to speculation that he might be withdrawing from the race. Following his threats to remain in the race until the end, I doubt this is the case unless his contributions are drying up. Perhaps this is a means of getting more coverage for attacks on Romney and an attempt to remain relevant until we reach southern primaries which might be more hospitable towards Gingrich. On the other hand, maybe we shouldn’t pay much attention to his past statements that he plans to remain in the race. Sticking to commitments has never been Gingrich’s strong point.